I love lamb and it has always been my favourite meat. Whether it is in a Rogan Josh curry or a full on Sunday roast. It becomes very easy to cook the same cuts of lamb in the same way each time so I thought I would come up with something different this time. 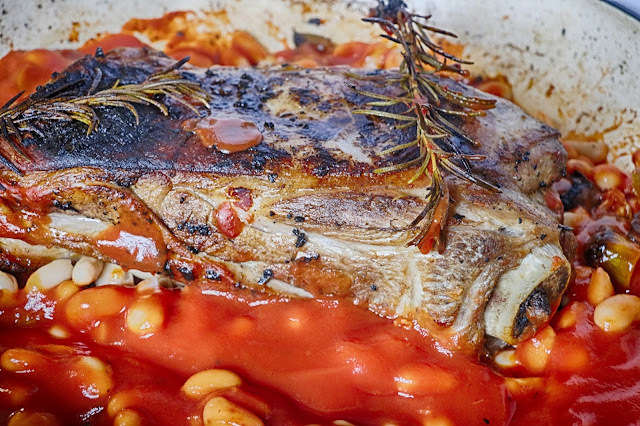 This is a fusion between some great British ingredients in the form of lamb and leeks and a hint of Mediterranean influence with the tomatoes and beans. The garlic and rosemary are much closer to home as we have grown it ourselves. With its one pot cooking this is great for a relaxed Sunday lunch. By browning the lamb first it gives the meat a nice coating. The lamb is roasted in the dish but with the liquid around it means the meat is really moist. We served it with some extra vegetables but decided that with the beans it didn't need any potatoes. We mix up our meals during the week to have a balance of red and white meat, fish plus lots of veggies from our allotment plot. By having this variety it ensures all the family get the nutrients they need to grow and thrive. Getting the right amounts of nutrients is difficult but a portion of red meat includes iron, zinc, B vitamins, selenium and potassium. According to public health nutritionist and mother, Dr. Emma Derbyshire, “Including a small portion of red meat in the diet a few times a week after weaning can help to bridge nutrient gaps and so help to maintain good health through childhood and beyond. The combination of all the flavours meant it was a sure hit with all the family. There were requests for seconds but everything had already been served. I'll just have to cook it again! Equipment: Large casserole dish with lid, frying pan if casserole dish can't be used on the hob. 2. Rub the crushed garlic onto the lamb. 3. Heat the oil in the pan and brown the lamb all over. Remove any bits of garlic from the pan. 4. Add the leek, ¼ pint (140ml) of passatta and stock. Season with black pepper and place the rosemary sprigs on top. 5. Put the lid on the top of the dish and cook in the oven for 50 minutes. 6. Remove from the oven and add the remaining passatta and the cannellini beans. Cook for a further 30 minutes. Really interesting combination of ingredients and looking forward to trying this one. Commenting for myself and on behalf of BritMums and thanking you for taking part.